As always, we'll discuss your favorite recent comic book reads and our featured book of the month. December's book of the month is ROCK CANDY MOUNTAIN: Come inside and meet the mysterious, unbeatable hobo Jackson on his quest to find the mythical hobo heaven. Meet his sidekick Pomona Slim. But watch out for the Devil! And the FBI! And the Hobo Mafia too! It's a fantastical fisticuff frolic through post-World War II America via the rails and backroads, through underground fight clubs, prison, and the hobo jungles wrought with dangers, hobo fights, jokes, and locomotive excitement. 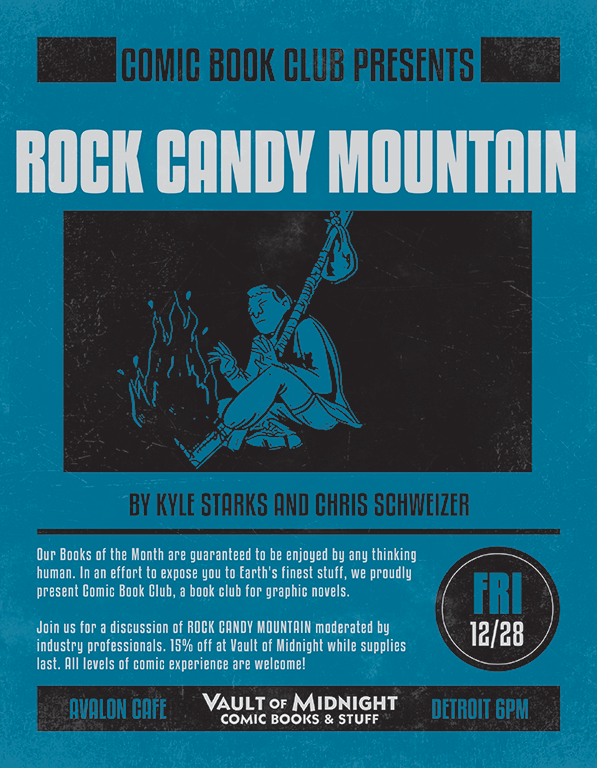 ROCK CANDY MOUNTAIN is on sale at Vault of Midnight for 15% OFF all of December [while supplies last]. Don't forget; Vault of Midnight validates parking in the Z Parking Garage for up to two hours with any purchase.